Come nightfall, Nha Trang is a party city, with plenty of cafes, pubs, beer gardens, clubs, bars and lounges to choose from. You can drink and party in Nha Trang at all price ranges, from local Vietnamese beer joints with VND 15,000 beers to classy hotel establishments with Western-priced cocktails, there is no shortage of places to go out and have a good time after the sun sets. 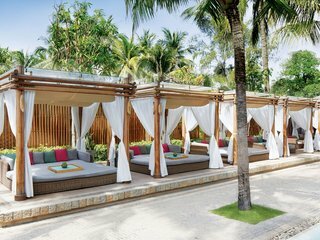 Having the advantage of being a coastal city, sipping a drink on the beach is as simple as walking down Tran Phu - the main street in Nha Trang - and stepping into whatever beachside establishments you fancy. 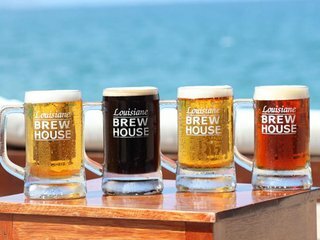 One our favorite establishments is the Louisiane Brewhouse, a stylish beach cafe-restaurant-brewhouse that is all pool, palms, beer and beach. It’s an excellent place to chill out by day and watch the sunset come evening, all while sipping some seasonal microbrews. Another quality venue is the Sailing Club, the only 24-hour club in Vietnam. The Sailing Club features great food and great music, but at a high price. Travellers may opt for a morning Lavazza coffee, a sunset dinner and an all-night party at the well-known venue. Generally, Nha Trang is a safe place during the day, but after hours pickpockets may pose a threat in more shady areas. As with any big city in Vietnam, you should be OK travelling on the main streets at night while having a night out.